Just how important is breathing for your health? PART 2. If you haven’t read the first part of this two part blog then click here. So, after reading the first part of our blog post we know the basic mechanics of breathing and the benefits and positive effects it has on the body. Let’s now take a closer look at how poor breathing habits can lead to poorer health and sometimes pain and dysfunction. 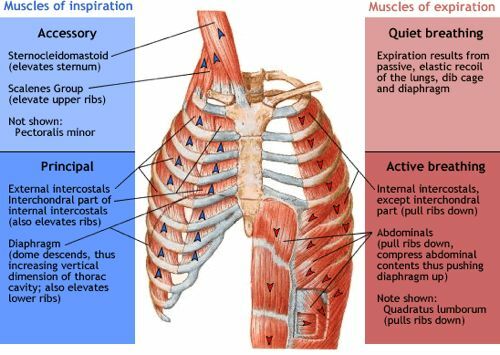 The many muscles of breathing! 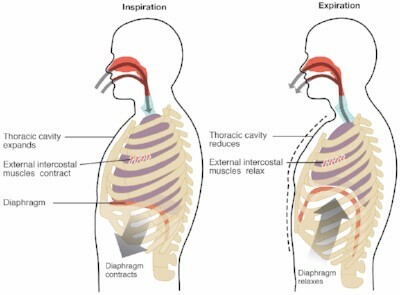 Last time we focussed on the diaphragm as the primary muscle for breathing. There is however, several other muscles that assist with breathing, particularly in the neck, shoulder and even low back regions. On occasion, an ‘over-use’ of these muscles and ‘under-use’ of the diaphragm can contribute to pain and dysfunction. In modern day living we tend to over-use the accessory muscles in the neck to lift the upper ribs and fail to adequately use the diaphragm to breath. This puts extra strain on the musculoskeletal structures in the neck and back which provide the anchor points to create leverage for these muscles to work. If this is chronic, bearing in mind we breath approximately 15 times a minute or 1260 times per day, this can lead to these areas being overworked and fatigued, thereby making you more vulnerable to pain and dysfunction of the neck and shoulder area and back. Why do we not use our diaphragm enough? Difficult to answer this one. I think sitting is a big issue. Many of us these days have to do a certain amount of sitting. Some of us work almost exclusively sitting at a computer even. 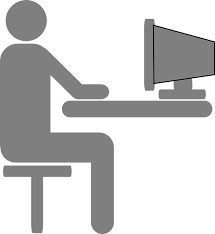 Sitting tends to compress the abdomen, thereby reducing the ability of the diaphragm to contract and the abdomen to expand. Hence we have to use our accessory muscles to facilitate breathing and keep our breaths deep enough to inhale sufficient oxygen. Additionally conditions such as asthma, due to constriction of the bronchii (the windpipes leading into the lungs), means that we will tend to subconsciously use these accessory muscles more in an almost ‘panicked’ attempt to get more air into the lungs. Obviously not everyone will have pain and dysfunction if this is the case, but the old saying prevention is better than cure is probably something that as a society we could benefit from embracing a little more given the escalating cost of healthcare and the strain on the NHS. How YOU can improve the efficiency of your breathing? To increase the efficiency of your breath, you need to engage the diaphragm more and the accessory muscles less. Here are two very simple and non-time consuming exercises you can do that will make a real difference to your breathing and, if you do have back or and/or neck and shoulder pain, could help with that too. This exercise can be done standing, sitting or lying down; it doesn’t really matter. Simply place one hand on your chest and the other on your belly. Breathe in normally through you nose and try to allow only your belly hand to move, keeping the chest hand still and breathe out through your mouth. If you can do this you will be using more of your diaphragm and less of your accessory muscles. Do this exercise for a few minutes, 2-3 times daily to start. Once you become proficient at it (and its harder than it sounds) once a day should suffice. Once you have mastered exercise 1 you are ready to apply the incorporate the belly breathing exercise into this box breathing exercise. The main thing you need to remember for this is the number 4! Using the belly breath learned in exercise 1, you basically breathe in for 4 seconds (adjust your breathing so that a normal in breath takes approximately 4 seconds), hold that breath for 4 seconds, then breathe out for 4 seconds (again adjusting your breathing to fit 4 seconds), then hold on the out-breath for 4 seconds. Rinse and repeat this 4 times. This exercise is also very good for controlling or slowing down your breathing rate and to help de-stress. Again start out at 2-3 times per day and then do once per day once proficient. I find it particularly useful for helping me get to sleep at night. *Whilst these exercises are very simple and safe, we do recommend that before you start any new type of exercise that you visit a qualified healthcare professional first! And there you have it. Who knew breathing was so complicated or had such a powerful effect on other systems in the body. Give these exercises a go, in general patients that I prescribe them to find them helpful.